Across the street from the resort is a Shopping Center that includes a Large Stars SuperMarket, Coffee Cafe, Pizza Paradiso, Subway, DVD rental store, Mexican restaurant, and the offices of Kaanapali Beach Properties that will cater to your needs while on the island. The condo has everything that you need. The location is great, close to Whalers Village, but still quiet and peaceful. Owners are very helpful. We just came back from Maui... always so sad to leave!! Robert's suite had everything we needed and more. It was clean and spacious with beautiful views of the ocean from which we could see whales spouting from the master window every morning. Unit 353 was perfect for our family! Thank you, Robert! Mahalo from Vancouver, BC. We had a wonderful relaxing stay. The condo was very comfortable and roomy. The lanai was a great place to relax and watch the wales out in the distance. Robert was available for any questions we had. Looking forward to our next visit to Maui. Good sized unit in a great location. 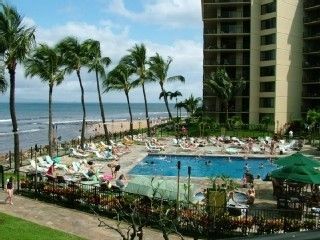 Overall we enjoyed our stay and I was pleasantly surprised by the great view of the ocean and really enjoyed the pools. There were a couple things that I wish had been different: it appeared that the cleaners forgot to wipe down the counters in the kitchen and bathrooms as there was a layer of dirt, including salt and pepper on the kitchen countertops. We saw one cockroach in the unit on our first day. I also wish I would have looked closer at the seasonings. I thought we were fully stocked, but when we went to make dinner, we found that almost all of the seasoning containers were empty. Although these issues were disappointing, they didn’t warrant contacting management and definitely didn’t dampen our vacation. We have stayed at other places in West Maui that we liked more (albeit they were more expensive), but I think for our next stay we will pay the extra money to stay in a nicer locale. We really enjoyed the vacation home. It was roomy and comfortable with nice views of the ocean and amenities from the deck. The pool was beautiful. The owner Rob emailed a great trip tip list his wife had done on the area. All check in information was detailed and easy to follow. The only thing that could be improved was the parking by the unit, sometimes it was hard to get a spot. Thank you Rob!! Loved the condo wonderful view. This was a great place to stay.